Chasing Hubble's Shadows - Universe Galaxies And Stars Section. Coaxing meaning out of a dash of colour is no trivial feat in observational astronomy. A minute arc of red gracing the edge of a Galaxy might be the sprinkling of energy from the beginning of time or a software processing error. Jeff Kanipe in his book Chasing Hubble's Shadows adds colour to these arcs and other findings by putting them into a context of universe evolution. He tells of today's astronomers, their tools of the trade and the results they are finding. With them peering ever deeper into space, we find colours that add a whole new depth to history. Book Review: Observational astronomy uses a variety of receivers to capture electromagnetic radiation across a broad band of the spectrum. The Hubble Space Telescope is one of the best known. Its well known images include the Hubble Deep Field, the Hubble Deep Field South and the Hubble Ultra Deep Field. From these we realize that black patches of night sky aren't empty but rather have a complex and visually enticing collection of swirling galaxies. Because of their distance, we know they came into being not long after the Big Bang and its evidentiary cosmic microwave background. These, and results from other detectors, have given Astronomers more to substantiate their postulations of the changes that shaped our universe. They see, or think they see, the evolution of matter and resulting radiation from moments after the Big Bang, through various dark ages and renaissances and on. Galactic morphology is a neat phrase and the gist of Kanipe's book. Its purview is to review work on the genesis of galaxies. The presumption is that the Big Bang did occur. After lots of rapid changes took place, galaxies came into being. These then died, moulted, collided or otherwise transfigured to the shapes we see today. Kanipe concentrates on radiative emissions, in particular redshifts. He offers notes and observations from Astronomers working with many of today's premier instruments, including the Keck scope in Hawaii, Europe's Plateau de Bure radio interferometer, and the infrared sensitive Spitzer Space telescope. As Kanipe is a science journalist, it is other people's words that carry the weight. However, with the inclusion of the views of many of today's and yesterday's leading experts, there is no doubting the content's authenticity. Being a journalist, Kanipe includes pleasant, descriptive prose together with very particular, specialized scientific concepts. For example, he writes that the universe 'makes a bombastic entrance then settles down to a languid, insipid period of expansion'. This is not to imply that hard details are absent, as many particulars abound. There's the Gun Peterson trough described as an absorption feature in high-redshift Quasars that can be used to test for reionization of neutral hydrogen. Findings are like detecting the universe's last scattering surface at a Redshift of 1100. As well, perhaps to give the reader a breath of air, Kanipe includes a review of his personal journey to the top of Mauna Kea, resplendent with tales of colourful shirts and adventures in oxygen depletion. Though the majority of this book aims to and succeeds at recording the gains made in the last decade, Kanipe also includes a look into the near future. There's the SKA or a Square Kilometre Array and the purpose it is to fulfill. Also, he includes a description of the Atacama Large Millimetre Array proposed for the Chilean Andes for millimetre and submillimtre observations. With these and others, Kanipe interweaves instruments, theories and people in a finely balanced review and prognosis. 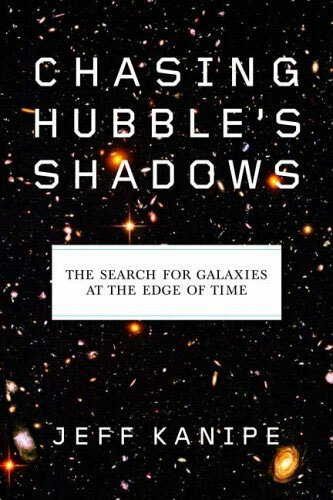 As the book's title indicates, Edwin Hubble looked at shadows to differentiate between ghostly errors and landmarks and others continue this activity today. Though it's easy to describe the contents of the book, it's not as easy to determine the best target audience. For example, mentioning the theory of leaking gravitons that makes our universe naturally self-inflationary demands a certain prior knowledge. Yet it isn't provided therein. On the other hand, the descriptions of many of the stellar events and the ground based research activities would be more appealing to the generalist. It is certainly a busy, well written review of recent and proposed work in observation astronomy. But, the level of writing is uneven. The blend between science and journalism isn't quite smooth enough. Nevertheless, the topic stays on focus with great quantities of relevant information. The Redshift of a galaxy's emission, like the lines on a person's face, give great clues to the source's age. Sliding redshifts in images show us light originating from the very start of existence. Jeff Kanipe in his book Chasing Hubble's Shadows tells of the last decade's hunt for larger and larger redshifts amongst galaxies and the chase to find the very first galaxy.